How to Download Apps on LG Phone in An Easy Way? Home > Resources > LG > How to Download Apps on LG Phone in An Easy Way? "So I got an LG Cosmos phone and the guy at the store told me that I can text, download apps on it, etc. I was like ok...and then I got home...and totally didn't know how to download apps. So I was wondering if anyone knew how to download apps on the LG Cosmos phone. THANKS!" Well, LG phone users are able to access a mass of applications because of the openness of Android operating system. With various types of applications, you can use your LG mobile phone as a gaming machine, productivity powerhouse or a social networking platform. However, apart from the big convenience the apps bought to you, where and how to download these apps to your LG phone is becoming an important question. What Can You Utilize to Download Apps on LG Easily? Google Play store is the biggest place for every Android user to download or purchase almost all types of application. To download apps on LG phone easily and quickly, you can draw support from Coolmuster Android Assistant, which is regarded as the best Android App installer program and it enables you to download, install, and even uninstall apps on your LG Android phone. Also you can use it to export apps from LG to computer for backup in case of unexpected data lost. What's more, it is fully compatible with almost all LG phones, like LG G6+/G6/G5/G4/G3/G2, LG V30+/V20/V10, LG Google, LG X Power, LG Optimus, LG Ally and other more LG smart phones. Android Assistant is also able to work on other Android devices, such as Samsung, HTC, Motorola, Sony, Huawei, ZTE and so on. Just click the following button to give it a try. After you downloaded and installed the Android Assistant on your computer, you can launch it to bring up its starting window. To have your LG phone recognized successfully by the program, please connect your LG phone to computer with a USB cable, and enable USB debugging on your LG as prompted if it is the first time you link your LG phone to this computer. Then, you can see your LG phone is detected and shown in the program window as below. 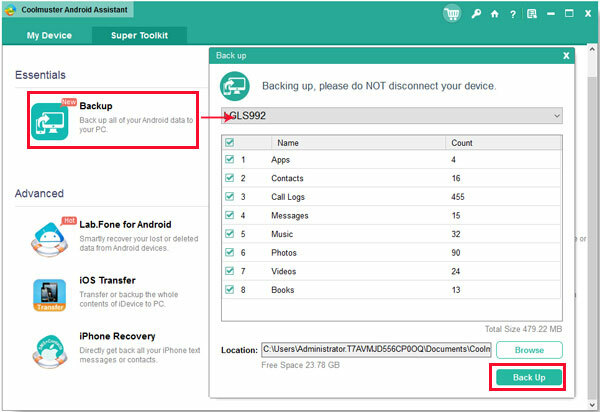 You can manage different files on LG, such as apps, contacts, call logs, SMS, music, photos, videos, books and more. Go to the left top menu, press "Apps" > "User Apps" tabs and choose "Install" button to bring out the Google Play Store window to you. Here, you can search the apps you want to download and then the apps will be downloaded and installed to your LG phone directly. If you have any apps you want on computer, you can also browse the apk files that you have downloaded on computer and install the apps on your LG phone directly as well. 1. To backup and restore LG apps, you have two ways to go. When you need to install the apps you have backed up onto LG phone again, simply click "Install" button to reinstall it like Step 2 of Part 1. Way 2: You can also go to "Super Toolkit" tab, click "Backup" button, choose your LG phone, select "Apps" in the pop-up window and hit "Back Up" button to backup all apps installed on your LG to computer immediately. Here, if needed, you can choose the location you want to store LG app file as you like by clicking "Browse" button before you back up. When you need to restore the apps you have backed up and install them on your new LG phone, you can also go to "Super Toolkit" tab, click "Restore" button, choose your LG phone and the backup files you want, select "Apps", (check "Clear data before restoring" if needed), and click "Restore" button to install apps on your LG phone again. 2. To delete apps on LG phone, you can follow these steps. You can choose any apps to uninstall from your LG phone effectively. To do so, please go to "Apps" > "User Apps" tabs, then check one or multiple applications you don't want from the app list, and hit "Uninstall" button. Thus all selected apps will be removed from your LG phone right away. 3. To share apps between two LG phones, you can check these steps. How to Download Google Play Apps in An Easy Way?